"What would Arnie do?" It was as such a perfect sound-bite, one suspected Jordan Spieth had scripted it in advance. In a Masters festooned with lavish tributes to the late Arnold Palmer, few encapsulate the attitude of 'the King' so vividly as his modern heir, a young Texan with ice in his veins and a sport at his feet. Spieth had a binary choice when hemmed in among the trees at the 13th, during the Saturday surge that triggered his pursuit of a second Green Jacket at the age of 23. Squirt the ball out sideways, and settle for a conservative par. Alternatively, thread it around a tree trunk, land it with delicacy on a lethal green, and set up a putt for eagle. So Spieth asked his caddie Michael Greller how Palmer would have approached it. It hardly needs saying that he took the second option, delivering to perfection. When he was told that his words had been picked up on the TV microphones, Spieth smiled knowingly. "I hit my favourite shot in competition in my life on that hole, going for it when we had that decision in 2015," he said. "There were good vibes. 'What would Arnie do?' was my way of expressing it to Michael. We all know exactly what he would have done." The moment emboldened Spieth to attack from the outset last night, sensing that a two-shot deficit to Sergio Garcia would help unleash his inner aggression. Remarkably, this was the first time in four appearances that the Texan had not held at least a share of the 54-hole lead, and the novelty appeared at first to unsettle him. His drive at the first underlined his occasional waywardness off the tee, perhaps his main weakness, as the ball plunged into a fairway bunker en route to a bogey that stymied his momentum. Spieth has an affinity with Augusta unequalled in the Masters' 87-year history. In three visits, he was a combined 25 under par, less by dint of Tiger Woods-esque dominance than his own precociously calculating brain. "It has just been about positioning: playing the course the way it is supposed to be played, where par could be your worst score, and giving myself short putts," he explained. "It is really a matter of thinking around it and using a bit of experience. I don't overpower it. I only hit 55pc of fairways - that's not very good. This place was Tiger-proofed at one point. You can't really Jordan-proof it." It is quite the habit with Spieth, that athlete's fondness for referring to himself in the third person. "Oh, Jordan!" he will admonish himself, after the most fractional error. Plus, there is the perpetual back-and-forth with Greller as they plot their path around Augusta like bomb-disposal experts clearing a minefield. Spieth likes to use the royal 'we' when describing anything he does in golf, as if Greller is an equal partner in a game rarely a collective enterprise. He competes in the most solitary of sports, although there is a sense that Spieth would have made the perfect team player had he chosen that path. His Ryder Cup record is formidable, especially in concert with Patrick Reed, while his younger brother, Steven, is developing a significant reputation in the Brown University basketball team. While Spieth and playing companion Rickie Fowler had their separate agendas yesterday, they managed to bring out the worst in each other with rounds of 75 and 76 respectively. 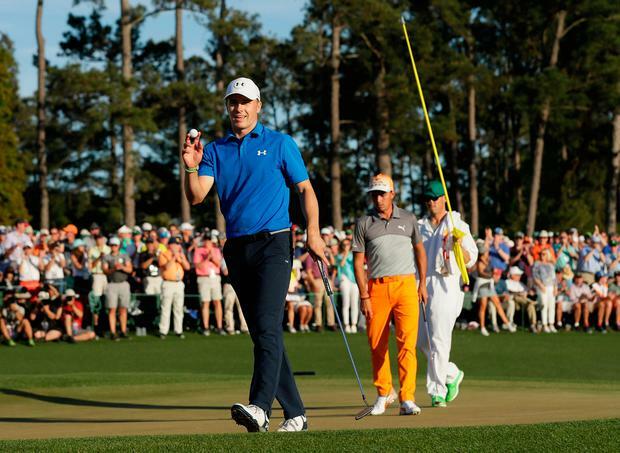 There have been signs at this Masters that the swaggering Spieth of 2015 has begun to return. That sophomore year on tour was a season for the ages, in which he achieved a better cumulative score in the Majors than even Woods had managed when he torched the record books in 2000. Even in the two he did not win, the Open and the US PGA, he held realistic opportunities on the final day. What dented his composure, however fleetingly, was his loss of a four-shot lead at last year's Masters, where a quadruple-bogey seven at the 12th sealed his demise at the hands of Danny Willett. Spieth claims that he weathered that disappointment in a matter of minutes, given that he still rallied over the final holes to ensure a runner's-up finish, and it is difficult to doubt him. A nine at the 15th in his first round would have consigned lesser players to oblivion, but Spieth refused to give up the chase.